For 13 years, the Hyde Park-based Neighborhood Writing Alliance has been creating opportunities for adults in low-income neighborhoods to write, publish and perform works about their lives. The Neighborhood Writing Alliance has always had roots at the University. Sunny Fischer, a School of Social Service Administration alumna, teamed up with University of Illinois-Chicago professor Hal Adams and Hyde Park resident Deborah Epstein to establish the organization, which then was moved to an office at Chapin Hall. 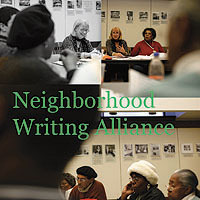 In recent years, as a member of the Southside Arts and Humanities Network—a program of the Division of the Humanities’ Civic Knowledge Project—the Neighborhood Writing Alliance has expanded, running 14 writing workshops around the city in which the participants produce content for the organization’s quarterly publication, The Journal of Ordinary Thought. The philosophy underlying the alliance is that “through writing and discussion about personal experiences—things that are happening in their homes, families, neighborhoods and the city at large—people will begin to explore political and social issues facing their communities,” said Executive Director Carrie Spitler. The workshops are located in the libraries, schools, churches and social service agencies in low-income neighborhoods. At each workshop, a facilitator helps to inspire and moderate discussion, and serve as the first editor of the participants’ work. The best examples of the work are then published in the Journal of Ordinary Thought. The Journal is published quarterly with two issues concentrating on specific themes and the other two showcasing the work of participants on any topic. “Even the themes come out of the workshops,” said Rupal Soni, Program Director. “We don’t mastermind them here, but we do choose the ones we can imagine sustaining people’s interest for four or five months.” During that time, the writing alliance creates programming that Soni hopes “helps participants to think about the themes in different ways and from different perspectives,” such as film screenings, expert speakers, discussions with community activists and participant performances. The next themed issue, titled Choices, will come out this summer. The supportive programming ranges from a seminar on how to make sound financial choices to a discussion that explores how to choose sustainable foods, following a screening of the popular film Soul Food. The informal networks that develop through the Neighborhood Writing Alliance are an important part of the mission. One of Spitler’s favorite anecdotes is about a workshop on the near-West side. A man who had never attended the workshop read a powerful piece about the daily grind of homelessness. Although no one knew whether he was speaking from personal experience, another participant, who happened to work at a shelter, slipped him a card, and it turned out the man needed a bed for the night. “It’s hard to measure, but we know things like that happen all the time,” said Spitler.